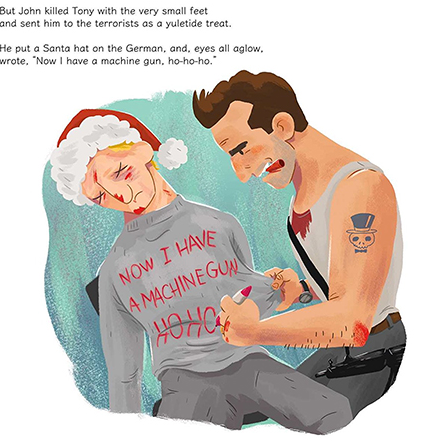 Run — don’t walk — to Amazon right now and order this: an all new, just-for-this-Christmas children’s book titled, “A Die Hard Christmas“. Yes, you can cozy up by the tree with your little one and a healthy dose of John McClane blowing away terrorists, complete with bullets, blood and violence for, oh, about $15. The all new children’s book comes out in October and is written by comedian Doogie Horner, and illustrated by JJ Horner. It was allegedly inspired by the classic Christmas poem, Twas the Night Before Christmas, but we really know this is all about Die Hard — well, and Christmas. This sure-to-be-a-collectors edition will most certainly sell out quickly. Even though the movie is pushing 30 years old Die Hard has long been considered a Christmas classic and that means this book, no doubt, will rank well with the other books of Christmas that are so popular: Dicken’s A Christmas Carol, The Bible, and, of course, Lifesavers Book of Candy. Puts you in the mood for Christmas, doesn’t it? A Christmas purist with an enthusiastic style, sometimes almost poetic. Chuck is a master of Christmas storytelling with a keen eye for social history and a stickler for yuletide decorum, tradition and legend. Chuck writes on all holiday topics, usually with unbridled joy and unvarnished delight. The term sick comes to mind right away. Of course they would all say this; especially the writer who rakes in plenty of dough over this movie during Christmas. Just because he says so, doesn’t mean it’s so! He’s part of this capitalistic society that feeds off the ignorance/consumerism of people.